The most deluxe model offered by Sacro-Ease®. With a lot of extra padding in addition to their traditional steel frame and rubber construction, the Deluxe Model 2000 is one of McCarty's best. Used daily by truck and taxi drivers, on buses, airplanes, and boats. One of the few lumbar supports that hold up to intense use by bus drivers, law enforcement officers and mobile salespeople. Plush rolled, pleated, and heavily padded design for comfort. 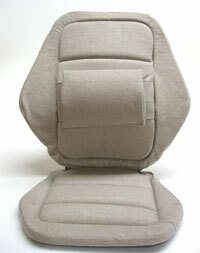 Wings on back and bottom provide lateral support in deep contour seats. 4-way adjustable lumbar support maintains the natural curve of your lower back. 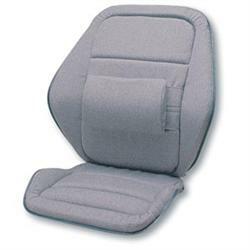 Adjustable lumbar pad can be completely removed or repositioned. 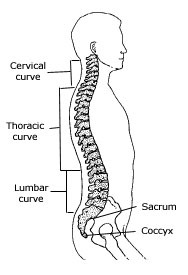 If your natural lumbar curvature is average or mild, you may be more comfortable without the pillow. Firm seat bottom prevents you from slumping down and forward into even the cushiest of sofa cushions or sagging carseats. 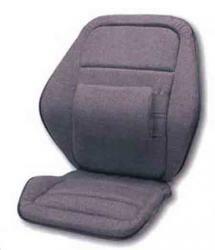 Upholstered in automotive-grade fabric that's cool to sit on and sponges clean with soap and water. Impact-resistant metal hinges control backrest angle and allow you to fold it flat for carrying. Seat and back are 19" wide. The following options are available by special order. NOTE: Special order items are not returnable. CF Comfort foam adds 1-inch of revolutionary visco-elastic memory foam on top of the latex rubber supports in both seat and back. Coccyx Cut-out for pressure relief in the tail bone area. Leather seat warning! 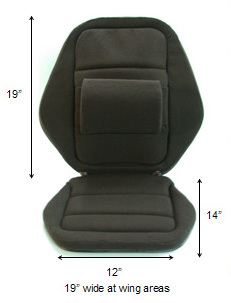 Be sure you use the correct size Sacro-Ease in a leather bucket car seat. If you squeeze a too-large Sacro-Ease into a too-tight space, the steel frame can cut into leather upholstery over time. This is a Special Order item. No returns, exchanges or refunds.